Florida 2019 Strawberry Festivals - Where, When and More Details! Looking for a strawberry festival in Florida in 2019? (just scroll down the page)There is no other listing as complete and current as this list, just updated! All the strawberry festivals in Florida we can find are listed on this page! If you love strawberries, look for a festival near you below! And I'm always looking for more strawberry festivals! Please write me, if you know of any to add! I update the dates as soon as the festivals publish their information, but you can always click on the links (usually the name of the festival) to see the current information on the festival's own website. They are different in what they offer, so they are grouped separately. (of course not all states and areas have both. And following the festival listings are links to our easy to follow directions about making strawberry jam, freezing strawberries, strawberry pies and much more. 325 West 3rd St. Boca Grande, FL 33921. Phone: 941-964-2479. The Annual Strawberry Festival, one of Boca Grande's most popular community events, draws hundreds of bargain seekers and lovers of homemade strawberry shortcake each year. The Boutique features new and or hardly used upscale merchandise and the Silent Auction offers the opportunity to bid on handcrafted items and artwork. All proceeds support programs to improve the lives of women and children locally and internationally through worldwide mission programs. Join us the first Saturday in March. 100 East Call Street, Starke, FL 32091. Phone: (904) 964-5278. Open: April, Saturday and Sunday, one weekend, 9 am to 7 pm on Saturday, 9 am to 5 pm on Sunday. . Family Fun, Entertainment, FREE Train Rides and Bounce House, Strawberry 5k Run, Food and Craft Vendors [BBQ Spiral Taters, Hillbilly Home Brew, Arepas, Gyros, Smoothies, and more. ], Pet Friendly. ATM Machines. Click here for a link to our Facebook page. Floral Park, 9530 S Parkside Ave, Floral City, Florida 34436. Phone Number: (352) 795-3149. [email protected].. 2018 prices Admission $5, Children 12 & under free. Parking at and shuttle from the Citrus County Auditorium free with price of admission. The Floral City Strawberry Festival is a salute to local agriculture. Ferris Farms, our local grower, supplies hundreds of flats of strawberries that are made into fresh strawberry shortcakes, and are also sold fresh to festival-goers to bring home to make their own strawberry delicacies. Fresh strawberries from local grower Ferris Groves will be available for purchase! Fresh-picked full and half flats will be located at the strawberry flats tent next to the shortcake tent. For ease in carrying them to your car, flats will also be available at each gate as well as the shuttle bus parking lot at the County Auditorium. The extremely popular and extremely messy pie-eating contests return on both Saturday and Sunday. There will be contests for adults, along with special contests for the little ones and maybe even super competitive "rival" contests. Sign ups to participate in the contests will take place onsite at the festival both mornings, at the Chamber Information Tent next to the Strawberry Shortcake Tent, beginning at 10 a.m. There are 3 categories: Ages 10 and under; ages 11 - 17; and ages 18 and over. Children's activities play a big role in the Strawberry Festival and will keep the little ones entertained for hours. Look for a petting zoo, an exciting variety of inflatables and bounce houses, the ever-popular aqua tumble bubbles, a climbing rock wall and much more. Nearly 300 booths filled with craft artists, local non-profits, and commercial vendors will make shopping a pleasure. And let's not forget about the food! Everything from seafood to BBQ, frozen smoothies and ice creams, craft sodas to homemade pretzels will ensure that you will not go home hungry. Enjoy an ice-cold beer or sip wine at the beer garden by the main stage. Click here for a link to our Facebook page. 2202 W. Reynolds Street, Plant City, FL 33564. Phone: 813-752-9194. The Florida Strawberry Festival is an 11-day community event celebrating the strawberry harvest of Eastern Hillsborough County. Each year, over 500,000 visitors enjoy the festival's headline entertainment, youth livestock shows, rides, exhibits of commerce and, of course, its strawberry shortcake.Considered one of the top festivals in the country, the Florida Strawberry Festival is ranked one of the best by the International Association of Fairs and Expositions. Over 62 years old, the Festival was established to celebrate the harvest of the strawberry that has made Florida the Winter Strawberry Capital of the World. Today, the strawberries share the spotlight with the finest country music entertainers in the business. There's all that famous fair food to tempt your tastebuds, but save room for dessert at one of our many strawberry shortcake booths! Exhibits of agriculture, commerce, education, industry, livestock, fine arts, horticulture, crafts and more. Festival Dates. Click here for a link to our Facebook page. 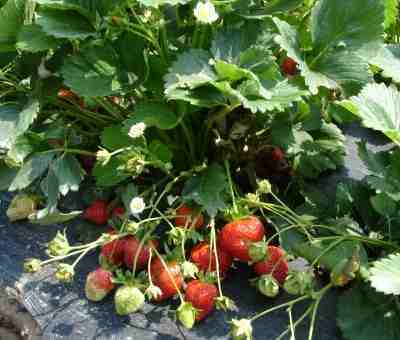 In addition to community and church festivals, some private farms have their own strawberry festivals in June. See each farm for this year's dates (they often do not announce them until the end of May). They usually have PYO strawberries then, too. Also, scroll down to see the links to recipes, freezing, canning and jam making directions at the bottom of the page.